In Italian, 'dolce' translates to 'gentle, sweet, soft, flowing'. This is the exact experience you will create for your guests when they see, smell, and taste a chocolate fountain from Dolce Indulgence. A fresh strawberry, pineapple chunk, or other treat dipped in a chocolate fountain is truly the food of the gods. Beyond being a delight to the senses, a chocolate fountain is also the center of a fun conversation area where your guests will surely gather. Warm chocolate flowing from a fountain for casual dipping may seem like a complicated and expensive luxury. Far from it! It is actually a very reasonably priced alternative that creates delicious memories for you and your guests. Prices start at just $85 for a small fountain, but the memories are priceless. At Dolce Indulgence we have been providing chocolate fountains for many years to the leading food service providers, caterers, Boston and suburban hotels, function halls, and country clubs. We take care of the entire process from setup to cleanup, and everything in between. 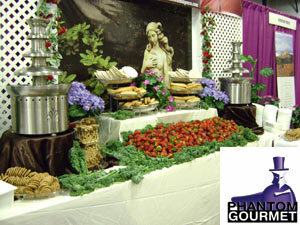 When you are organizing an event, you don't want to sweat the details of the chocolate fountain. With Dolce Indulgence you don't have to. The chocolate fountain arrives on-time, it is up and running when your event starts, and it is cleaned up promptly without a second thought from you. If you want an attendant to run the fountain, one can be provided. Attending to the fountain is nearly effortless, as it involves mostly keeping the area surrounding the fountain clean and educating the guests about it. But we can easily train you on what little there is to keep it operating smoothly. We will always listen carefully to your requirements and advise on the best way to provide a chocolate fountain for your specific event. Call or e-mail us today to reserve your date before it gets booked! !